The homeowners are fairly new to this house in the Shepherd Park Plaza neighborhood of Houston, and are doing lots of updates. In this dining room, they removed the built-in cabinet that was smack in the middle of this wall, as well as the chair rail molding around the middle. In the top photo, you see new Sheetrock that has been taped and floated in areas that were damaged by removing the cabinet. To make a perfect surface, I skim-floated the wall. 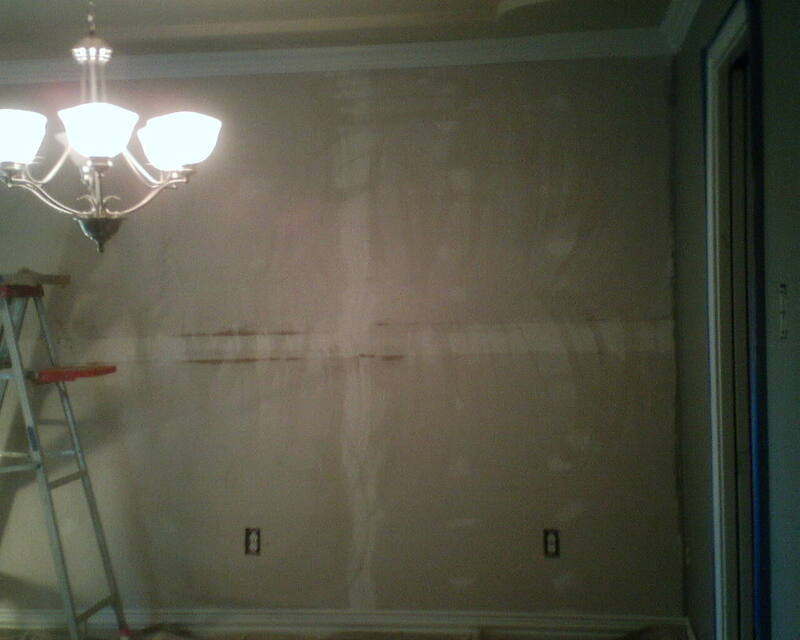 This eliminates hairs and grit from the drywall, and smoothed over the patched areas. I then sanded, wiped free of dust, and primed with a penetrating sealer called Gardz. The finished wall is shown in the second photo. 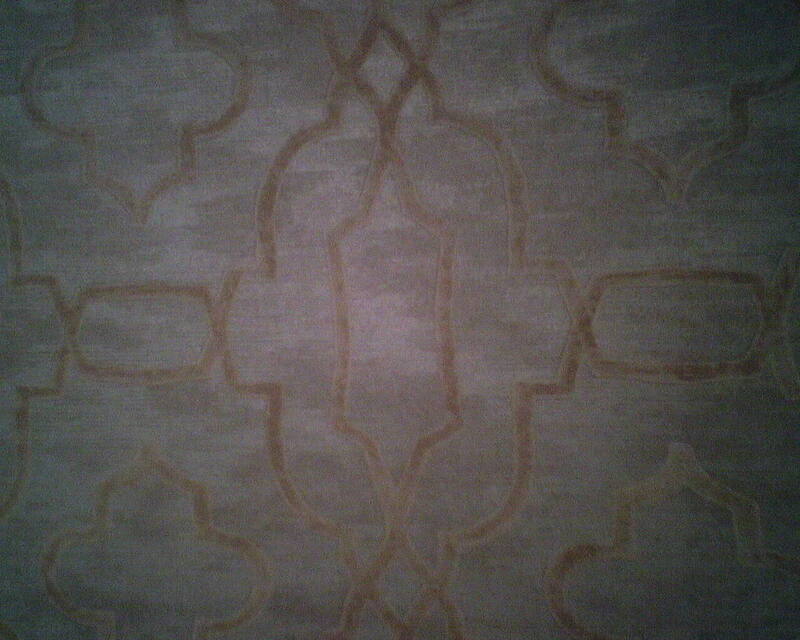 The homeowners found a paper that matched the colors on their walls and in their Oriental rug, and the scratchy, vague design is visible, but not at all overwhelming. I love the way that the trellis pattern mimics the carved design on the ceiling. 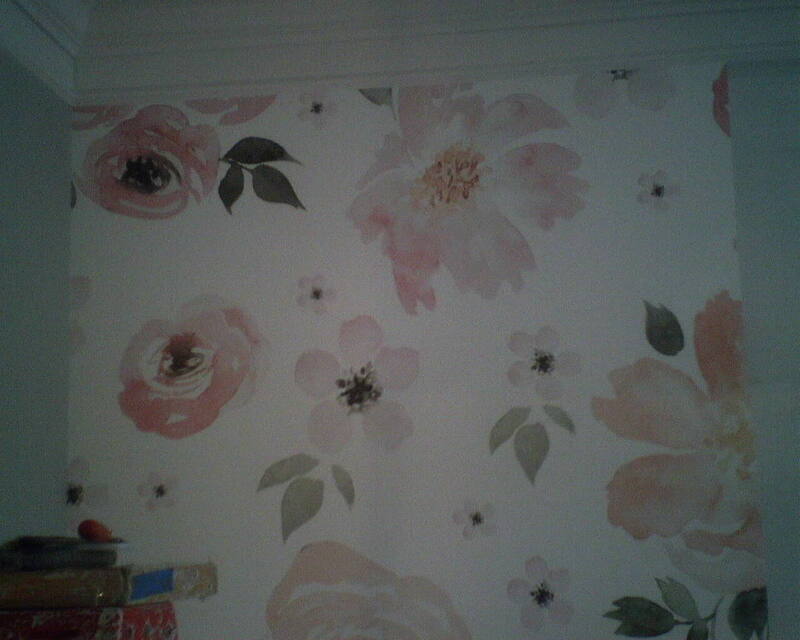 This wallpaper is by Designer Wallpaper, and was a non-woven, paste-the-wall product. 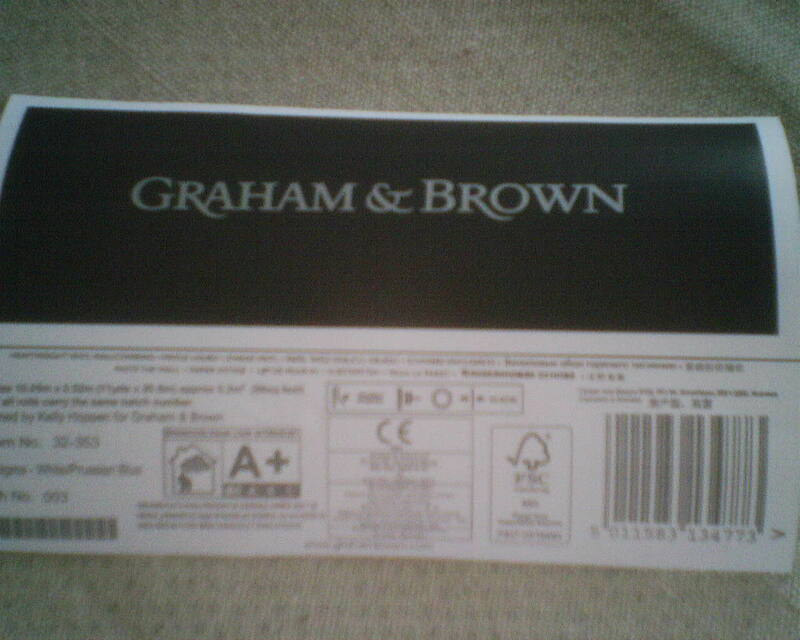 It was bought from Sherwin-Williams. 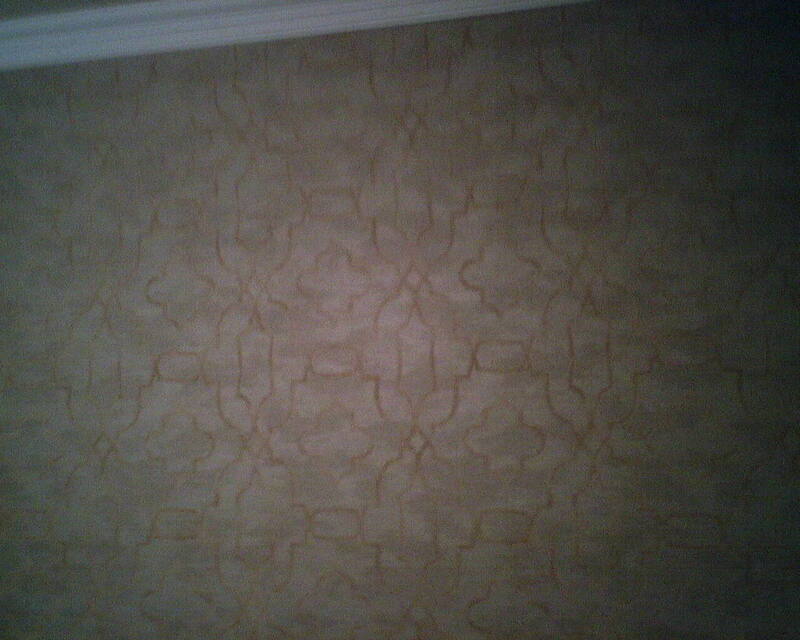 I made sure to center the pattern on the wall, so when they place furniture against it, the pattern will be balanced on either side. Look under the dark leaf. 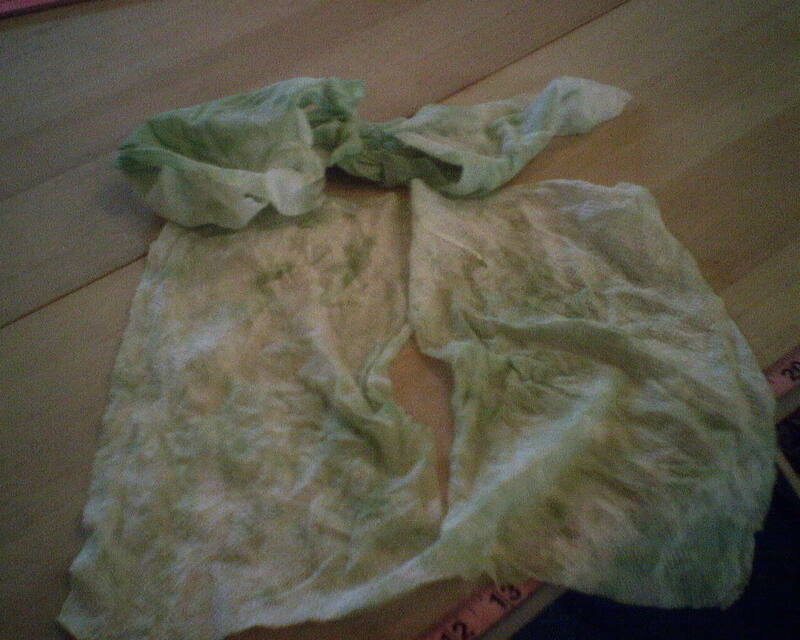 See the smears of green ink running downward? There are alternate ways to paste this type of paper, but since I had started with the manufacturer’s recommended method, I pretty much had to continue, since switching to another method might alter various aspects of the paper’s performance. 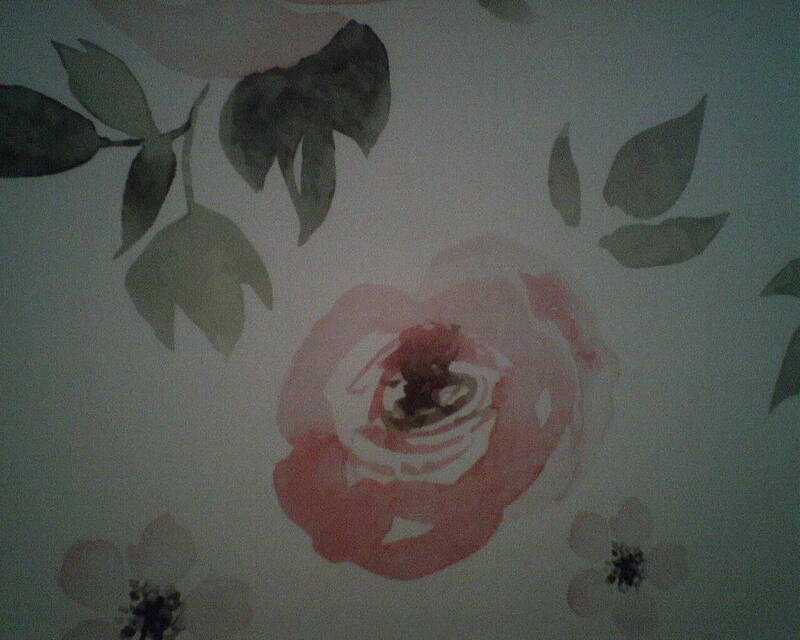 So I adjusted my usual techniques, and avoided wiping the paper with a damp rag, and instead used dry paper towels – lots of them. 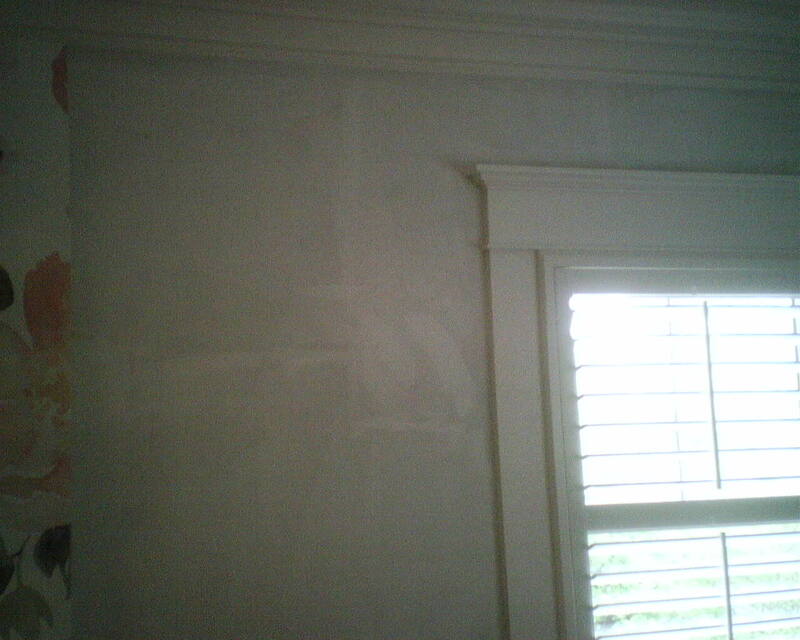 Old House / Crooked Walls / Straight Paper / ?? Who can expect the walls in a bungalow built on gumbo soil in the Houston Heights back in the 1920’s to be straight and plumb? These walls sure weren’t. 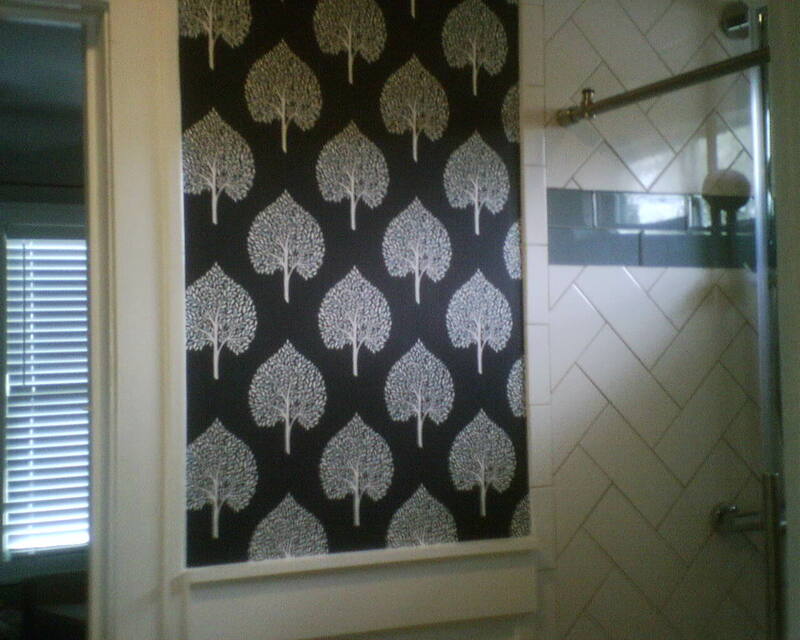 In the first photo, you see the tree motif running pretty evenly along the door frame and the shower tile from ceiling to wainscoting. But on the opposite wall (sorry, no photo), the door frame and tile were both off-plumb, so the wall was less like a rectangle and more like a trapezoid. 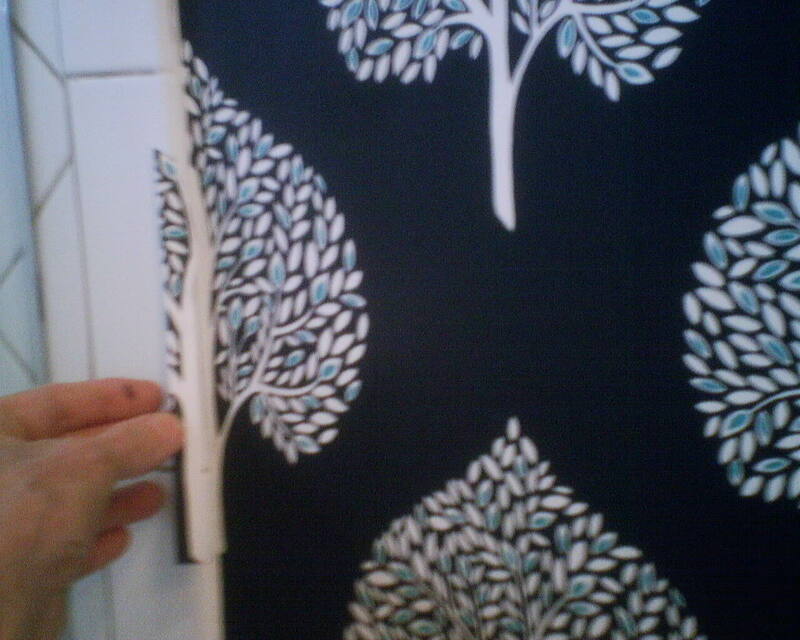 That meant that the white tree trunk started out at the ceiling about 1/2″ away from the tile, with about 1/2″ of navy blue along it’s left edge. But by the time it dropped a mere 5′ to the wainscoting, the white tree trunk was running crooked and disappearing into the white tile, with no navy blue showing at all. The eye really notices variances like this. I needed to get some navy blue showing again, along the left side of that tree trunk. 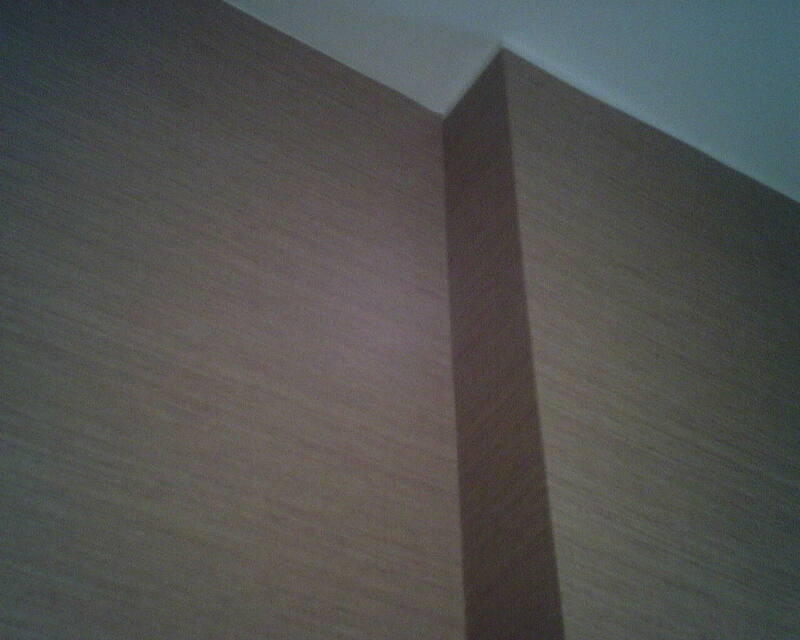 This non-woven wallpaper was too stiff to manipulate or maneuver into a plumb position, and a cut-and-overlap would have been very visible on this thick material. So I tried something else. In the second photo, you see where I have cut out a part of the pattern motif, which includes the white tree trunk and some of the navy blue area to the left of it. I then trimmed this piece so that it had 1/2″ of navy blue showing to the left of the tree trunk. Next, I appliquéd this piece over the tree, in the spot where it would have been if the wall had been plumb. Some leaves of the tree got cut off or obscured by this appliqué. 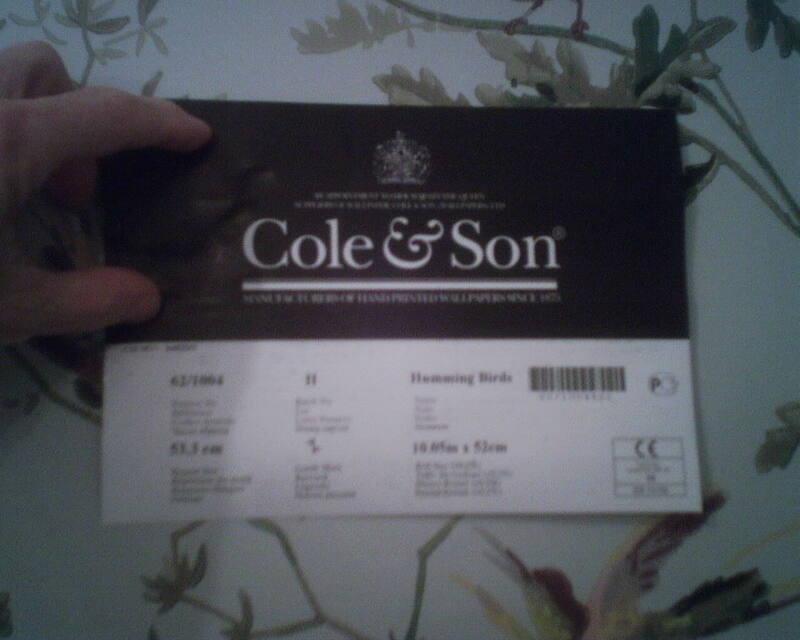 But that is much less noticeable than a disappearing navy blue line. 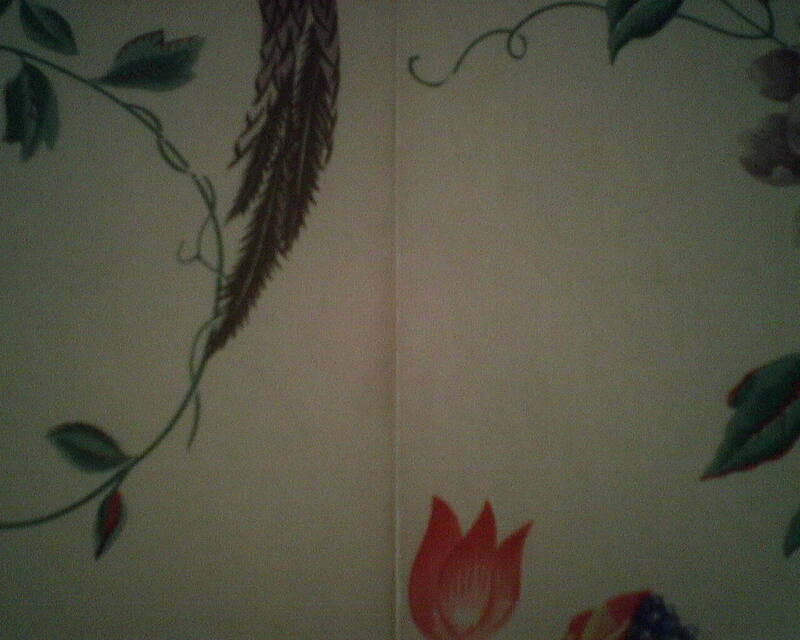 The trick I used maintains that navy blue line to the left of the white tree trunk. 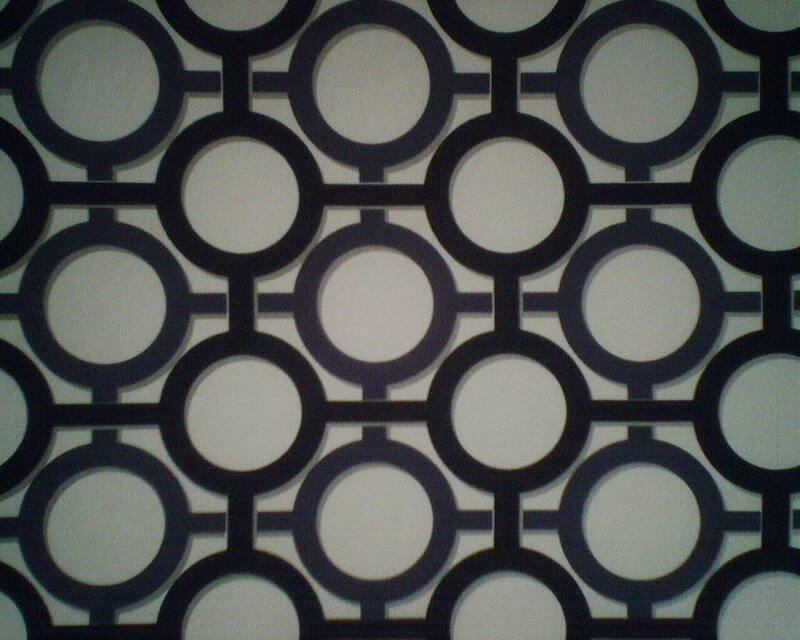 My trick ensures that the eye sees a uniform width of navy blue from ceiling to wainscoting. This is much less jarring to the eye. And it makes the wall look plumb – even though we all know that it has not been plumb since about, oh, since about the 1940’s. 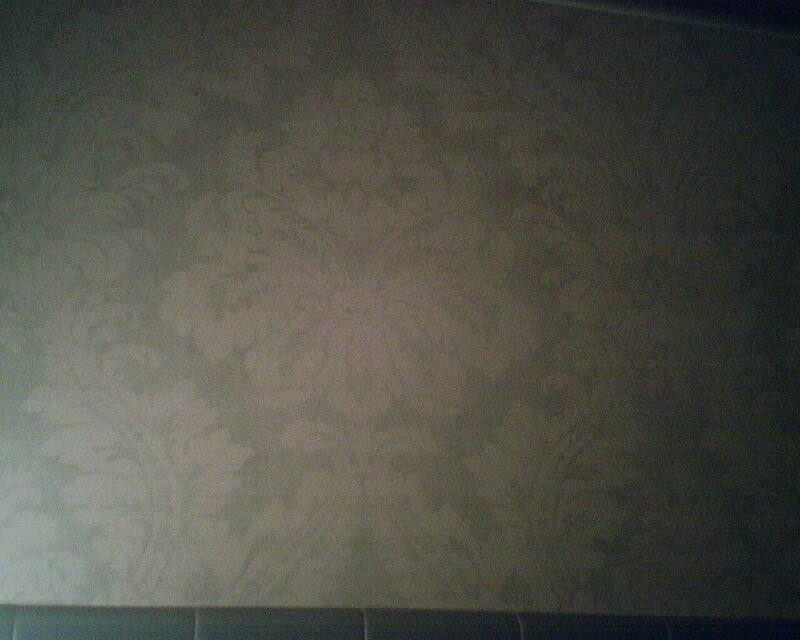 The wallpaper is by Brewster, in their A Street line, and was bought from the Sherwin Williams store in the Rice Village on University. 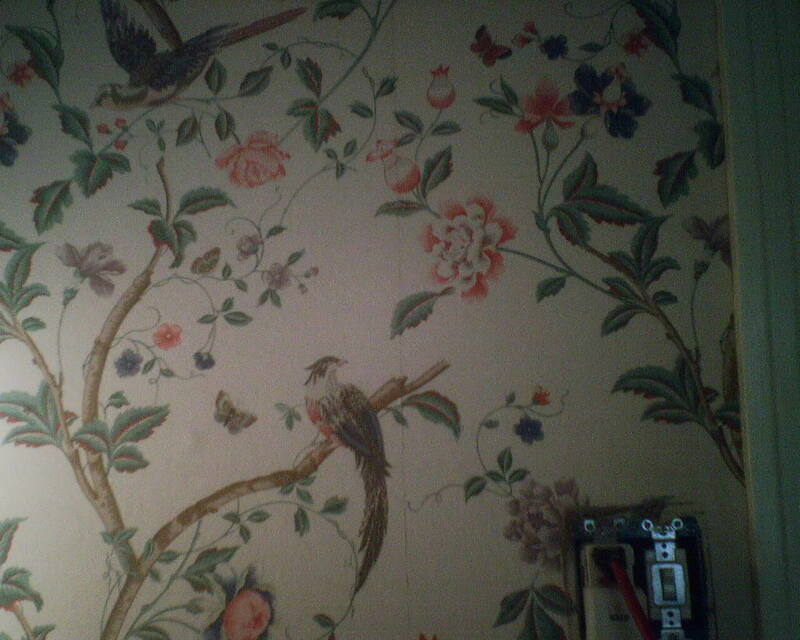 “The decision to go with wallpaper was a hard-sell,” said the husband. 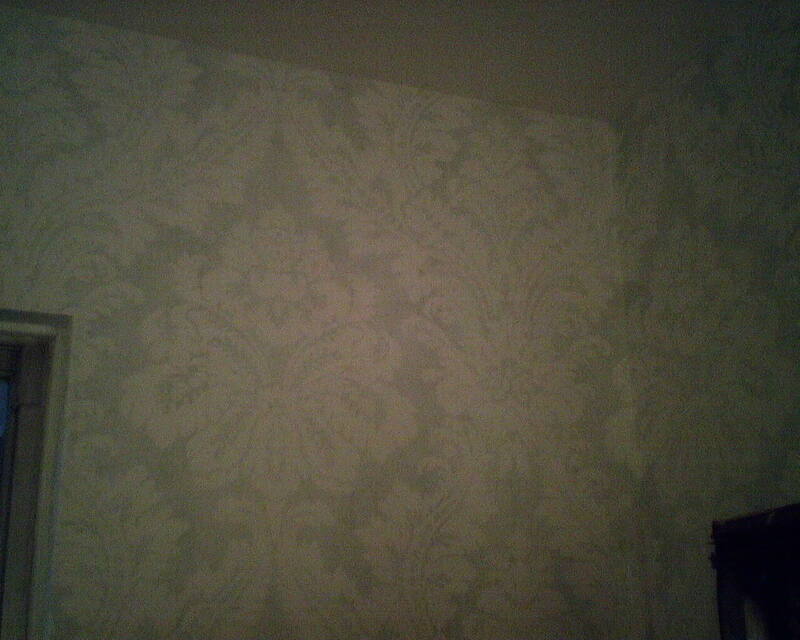 His previous knowledge of wallpaper was the flowery sort of stuff that your grandmother had. 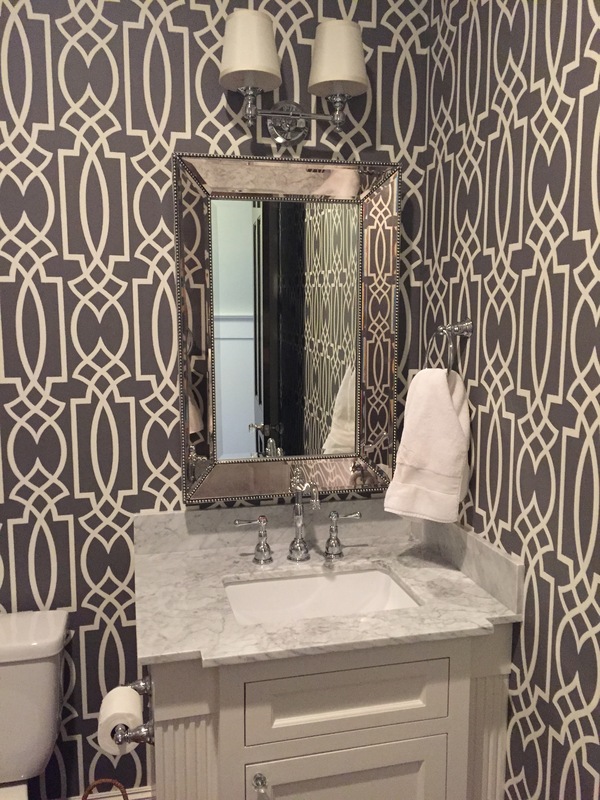 But the wife wanted some pattern and color for this bathroom that is share by a pre-school girl and an adjoining guest bedroom, in their remodeled 1920’s bungalow in the Houston Heights. 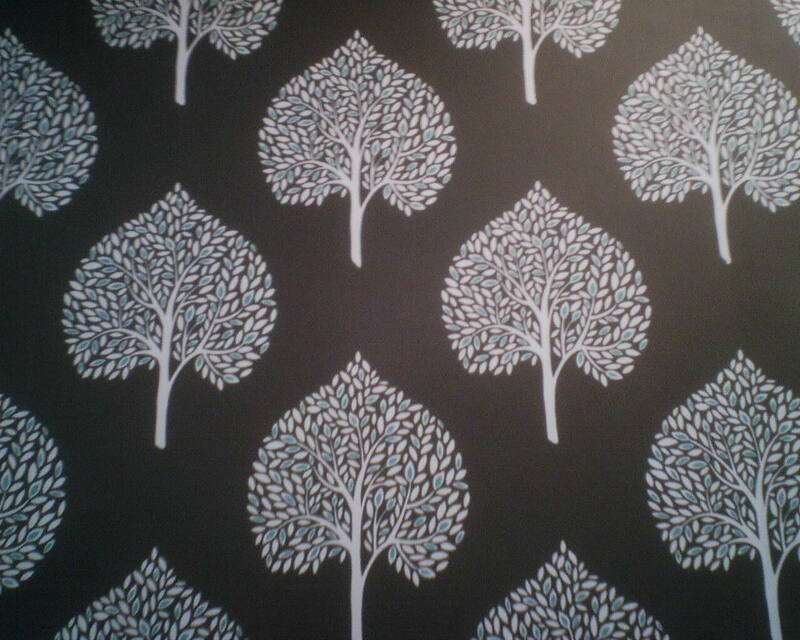 She found this fun tree design at Sherwin-Williams. 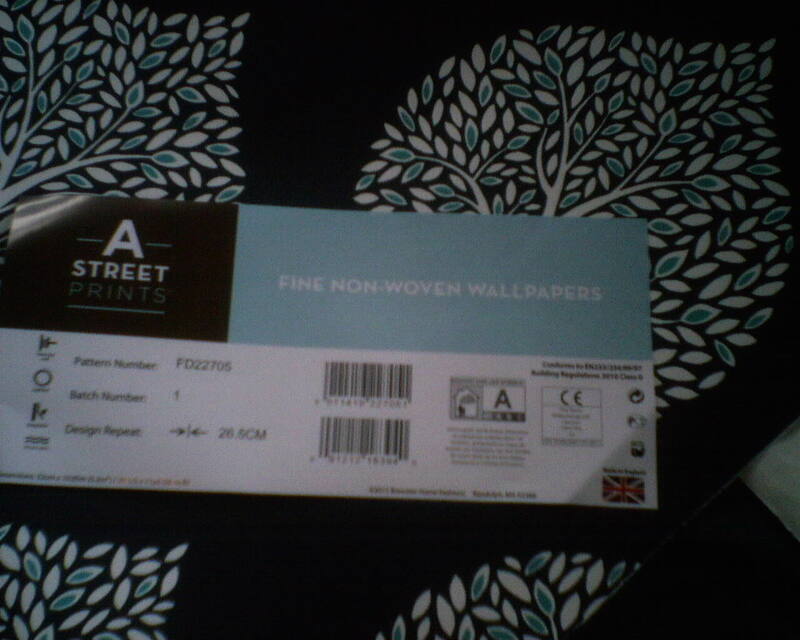 Once the paper started going up, Hubby was sold! Originally, the walls were all white, plus white wainscoting on the lower 3′ and white tile on the mirror wall. 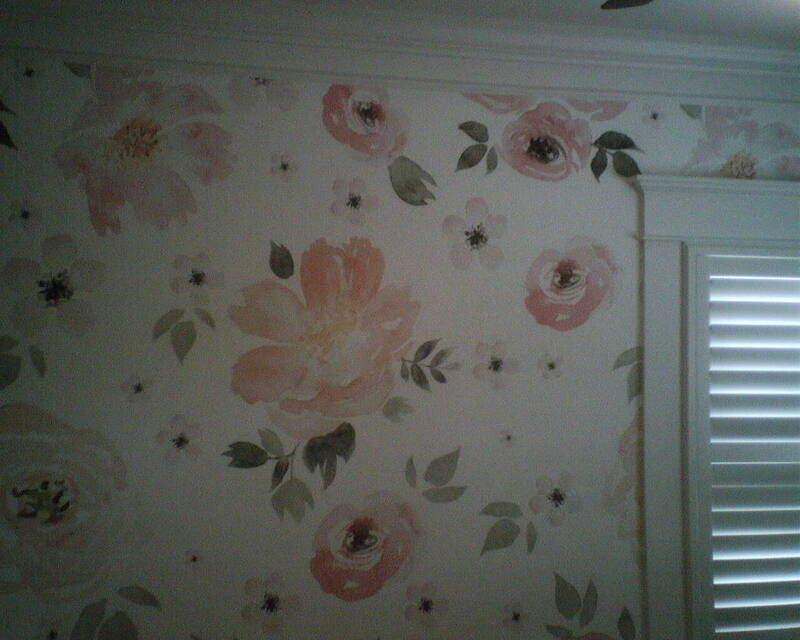 Clearly, the wallpaper brought personality and fun, and a bit of color to the space. 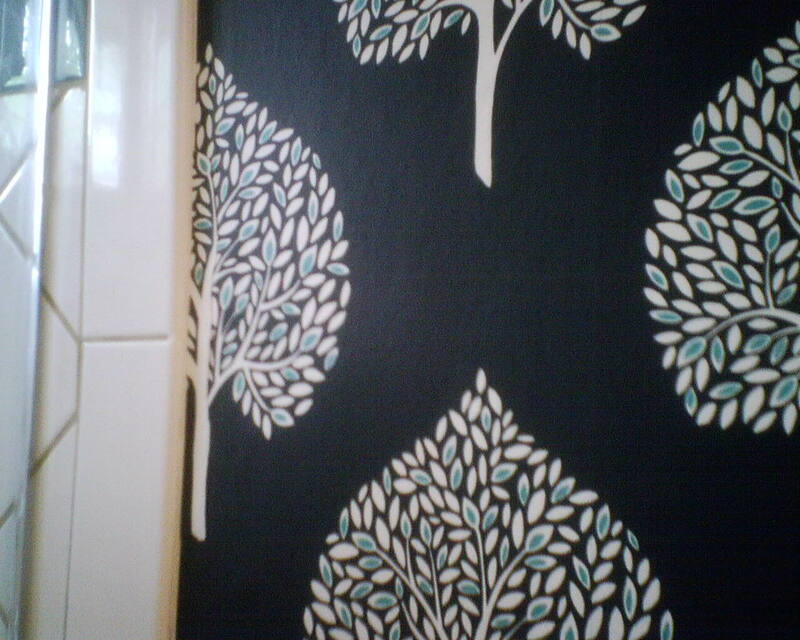 I also plotted the pattern placement so that both of those walls mirrored one another, and both had a half inch of blue space between the trees and the tile, and the trees on both walls were at the same height. It’s something you would not consciously notice when looking in the mirror, but your mind’s eye would sense that the area is equal and balanced. 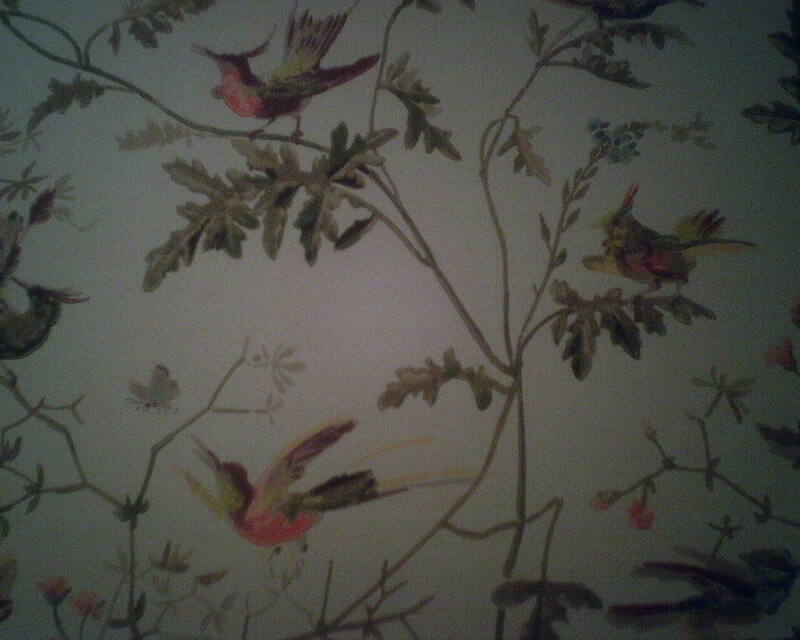 This wallpaper is by Brewster, in their A Street Prints line. 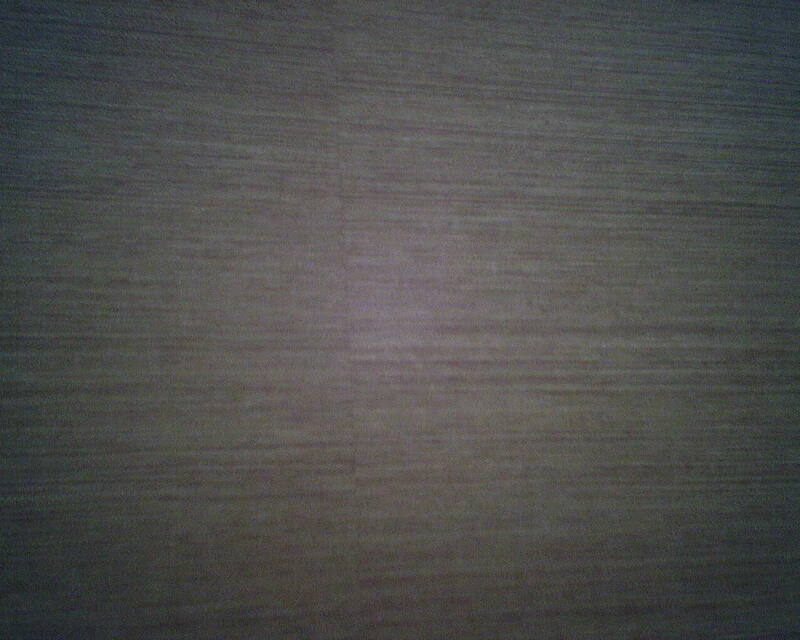 It is a non-woven material and a paste-the-wall product. The homeowners bought it from the Sherwin Williams store on University in the Rice Village – the store I deal with the most. 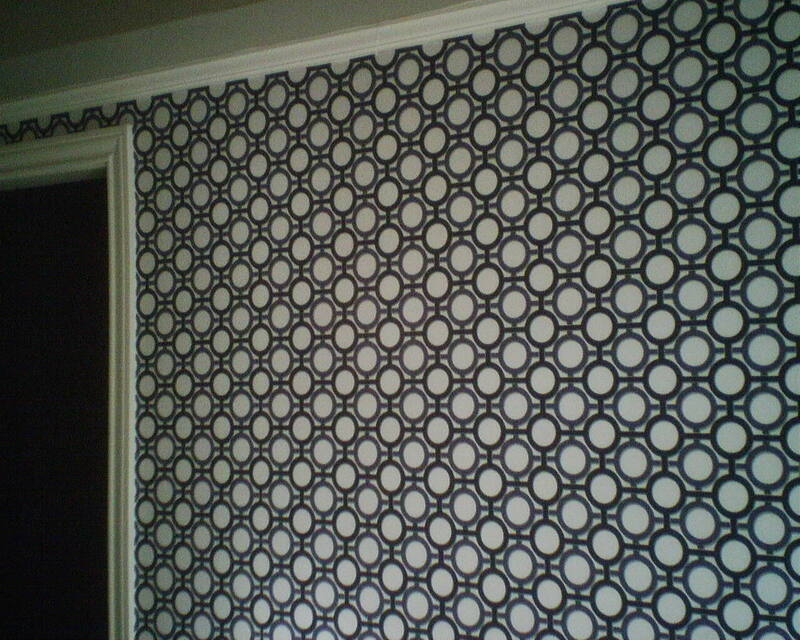 It was nice to work with, but, like many non-woven wallpapers, it was stiff and somewhat argumentative when turning corners or doing detailed work like cutting around intricate moldings. 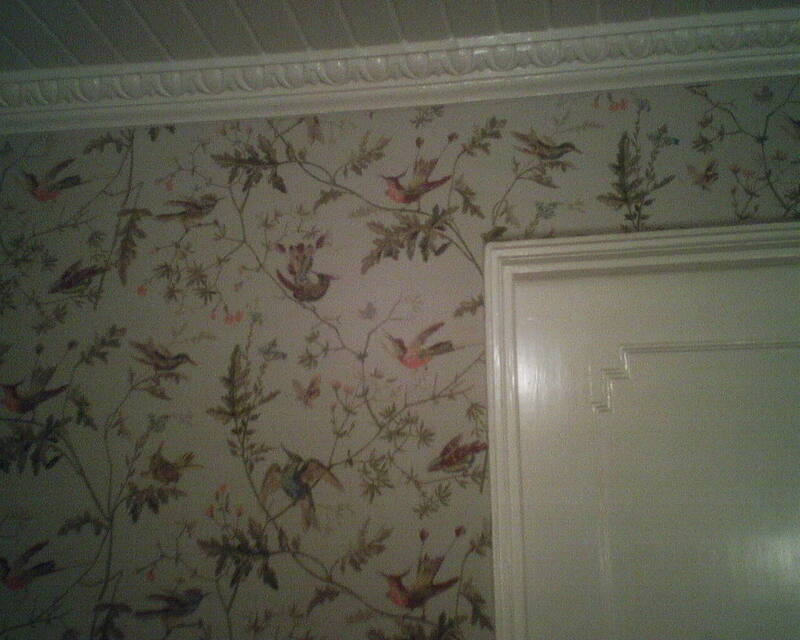 This is wallpaper with a huge repeat, custom-made to fit this wall. Essentially, it is a lot like a mural. What an impact it makes in this nursery, waiting for the new baby girl! 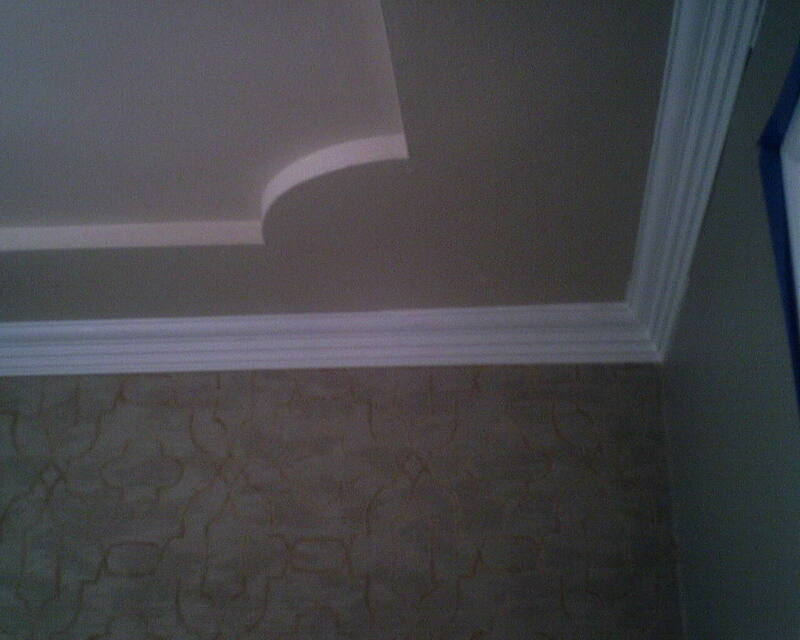 This product is on a non-woven substrate, and was a paste-the-wall installation. It is thick and stiff and difficult to tear, and is designed to be stripped off easily when it’s time to change décor. 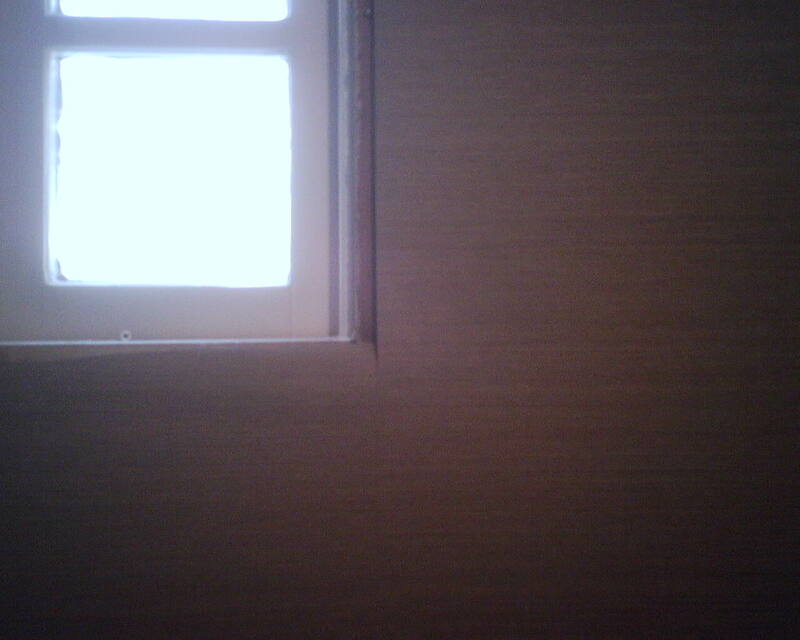 However, the stiffness a little difficult to maneuver into intricate areas like around the window trim. Grasscloth is all the rage right now, but I cringe when clients talk about using it. There are so many problems with shading and paneling and color variations (Do a Search in the upper right on these terms. 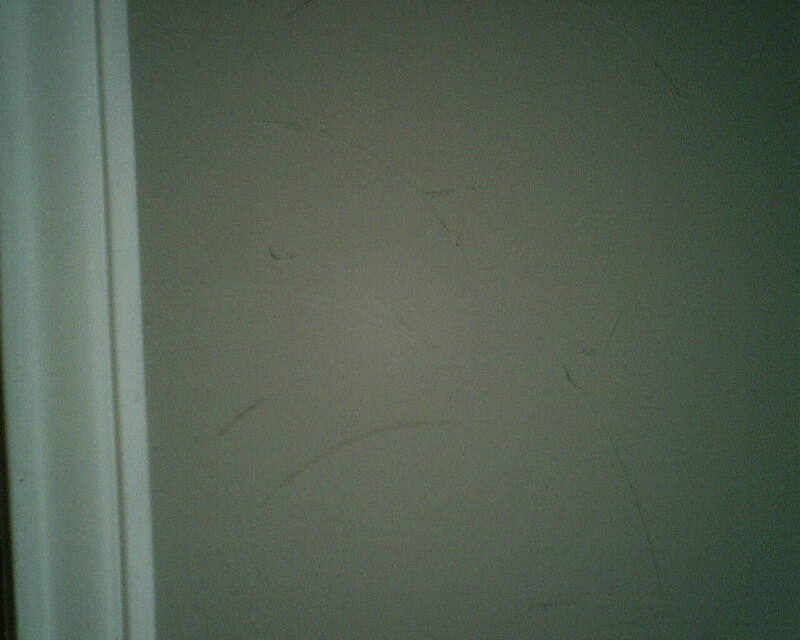 ), as wall as staining, bleeding, and shredding by pets. There are faux products that are pretty realistic, and some are better quality than others. (Again, do a Search here.) This homeowner wanted the look and texture of grasscloth in her bathroom, but knew that the real deal would not hold up to a busy family with little children. She found this paper-backed vinyl product on an internet sales site, and got a really good deal on some expensive paper. The rolls she got were not all the same run, so had to be kept on separate walls, but there was plenty of paper, so I was able to get the room done. I was very pleased that there were no color variations (except between runs, and I kept different runs segregated on separate walls), and she is happy that the vinyl paper will withstand water and little hands. The vinly surface is embossed with a realistic texture, too. I was able to do this powder room while the toilet and sink were out of the room, making the install much easier, and also ensuring that there would be no cut edges along the top of the sink (which could wick up splashed water and cause curling). 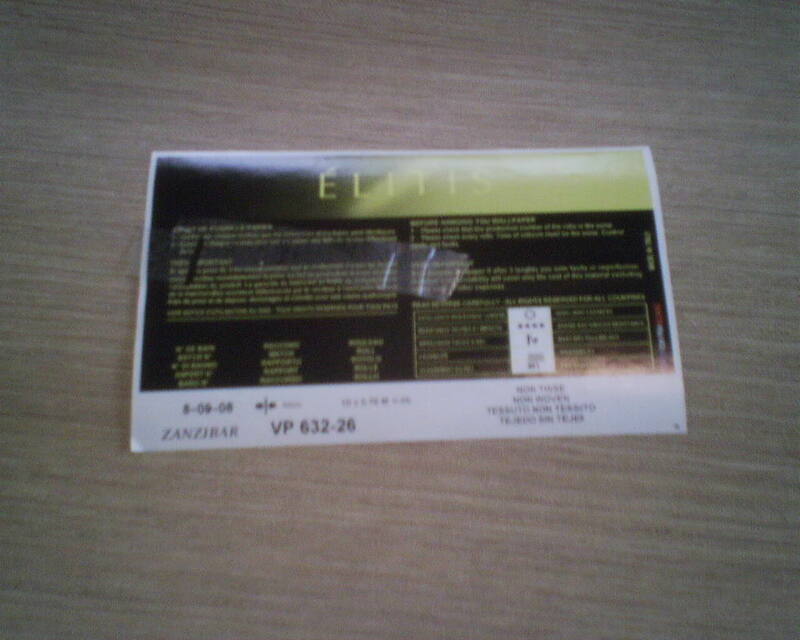 The brand is Elitis, a French company, and the product is a paper-backed solid vinyl. 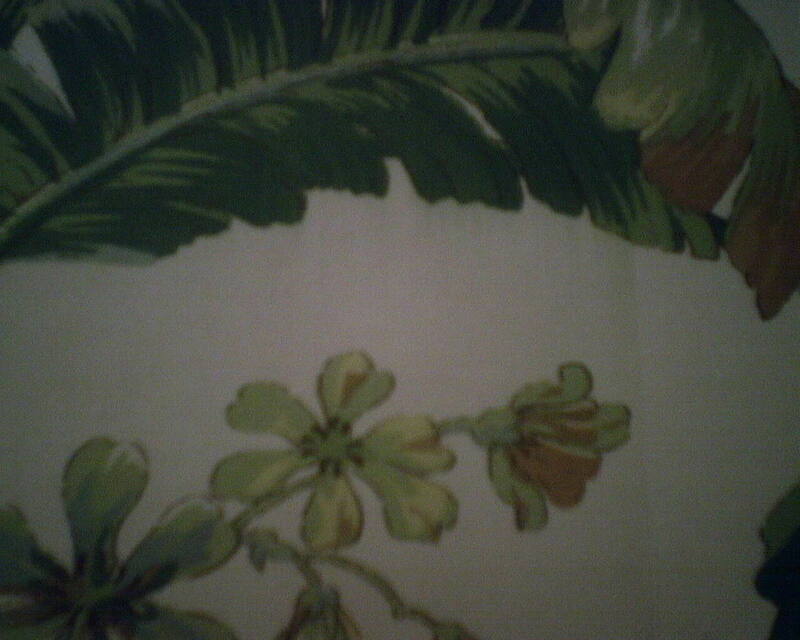 I hung this in the powder room of a darling 1930’s home in the Rice University area of Houston. 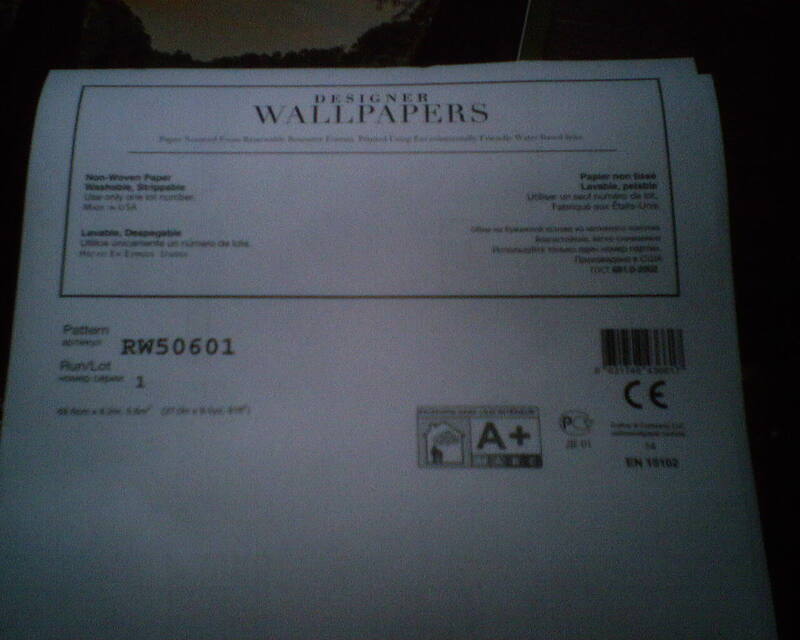 You are currently browsing the Wallpaperlady's Blog blog archives for March, 2016.